Norway’s most famous and best-preserved Viking ships in the world were also found in Vestfold, including both the Oseberg and Gokstad ships that are housed at the Viking Ship Museum in Oslo. Terje Gansum, in charge of cultural heritage for the county, said the georadar pictures show a “boatform” believed to be at least 15-meters long but it’s unclear how much of the vessel has been preserved. It was found within the county’s Borreparken, just south of Horten, which is known for its many grave mounds from the early Iron Age. They’re visible to the naked eye and are considered monuments to the political power Borre had more than 1,000 years ago. Only one of the mounds, known as Skipshaugen, has been thoroughly excavated. When it was dug out in 1852, it revealed that a documented Viking ship had been buried there, along with richly decorated bridles and stirrups for a horse and other objects believed to have belonged to people with high status. Much of it is on display at the Midgard Viking Center located adjacent to the Borre Park. 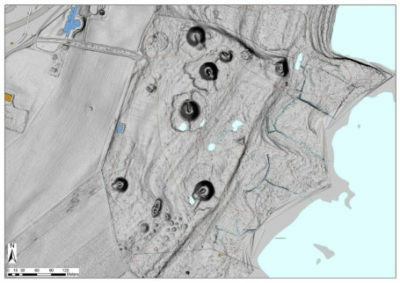 The new discovery is located close to the center of the park, just east of three large grave mounds. The nearby Borre Church dates from around 1100. “This is unique Norwegian history and it’s not possible to over-exaggerate it,” Elvestuen said as he wandered within stakes set up to show the ship’s formation under a remaining patch of snow. 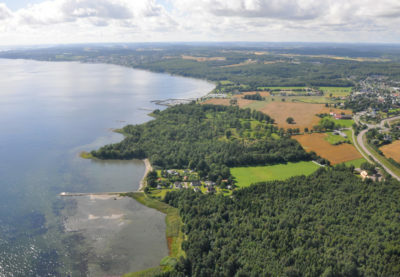 Another buried Viking ship has also been discovered on the other side of the Oslo Fjord and farther south, near Sarpsborg in Østfold County. It was made public last fall but no excavations have yet begun.